Volunteer Wardens for six Ecological Reserves in the Thompson Region recently met with Parks personnel. 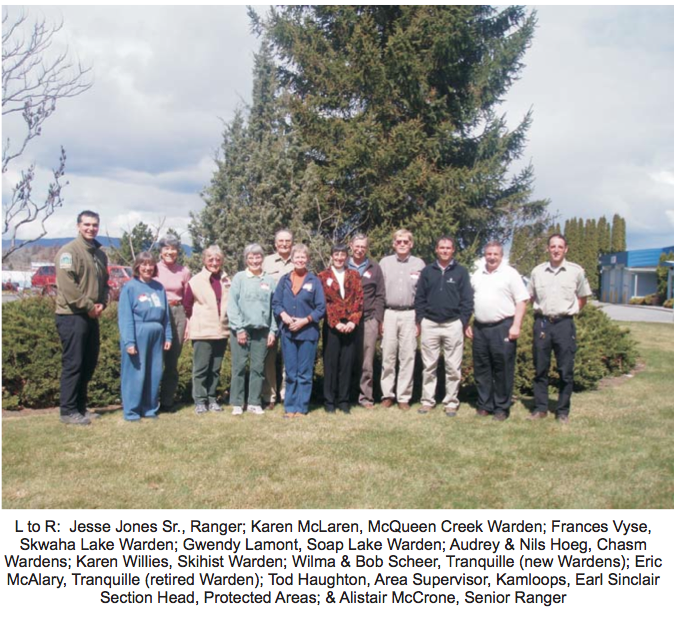 These wardens were Gwendy Lamond, Soap Lake; Frances Vyse, Skwaha Lake; Karen McLaren, McQueen Creek; Audrey & Nels Hoeg, Chasm; Karen Willies, Skihist and Eric McAlary, the retiring warden, as well as the new wardens Bob & Wilma Scheer for Tranquille. Chaired by Earl Sinclair, Section Head, Protected Areas, this meeting gave the wardens a chance to meet new Parks personnel and Rangers with whom they would be dealing. Ecological Reserve Warden Handbooks were passed out and liaison procedures, data gathering and reporting methods were discussed. Also mentioned was the advantage and feasibility of establishing a digitalized boundary (GPS) of each reserve. Earl Sinclair gave a “Parks for People” presentation, an overview of the direction BC Parks will be taking. Studies have shown that historical visitor use of parks has diminished in the last few years, as demographics have changed and parks must change to meet the new needs. BC Parks has established a goal of a 20% increase in park use by 2010 using the baseline of 2004 attendance. After lunch Donna Romain and Jesse Jones gave an overview on their vegetation survey techniques, which are used to identify areas in Parks with high noxious weed density. An Inventory and Monitoring Guide was passed out in order for wardens to record any weed outbreak that they might come across on their reserves. Earl Sinclair provided the status of Mountain Pine Beetle on reserves and how we were to going to manage for these changes. In keeping with the true purpose of Ecological Reserves, that they be used as bench marks, the devastation from the Mountain Pine Beetle would be left to run its natural course and used as a learning tool. The important role of wardens was stressed, particularly in the current climate where increased protected areas, plus increased responsibilities have not resulted in corresponding increased personnel or funding. Thus wardens can help with diligent monitoring of their reserve. A special presentation was made to Eric McAlary by Bruce Petch for the 20 years of service he provided to BC Parks as an Ecological Reserve Warden for Tranquille Ecological Reserve just outside of Kamloops.